After the recent collapse of the us market, investors started to demand premiums for the insurance portfolios on the S&P 500 index from declining to 1% in one day, although previously this award could cost a month protect. 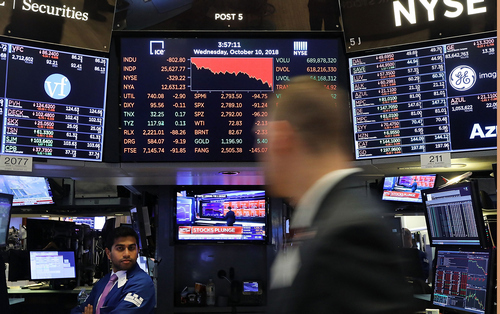 Market participants recalled that the global economic growth is still quite fragile. They assume that if he starts to slow down around the world (as the IMF predicts in its latest study), the continued rise in interest rates, the fed can easily ruin the relative prosperity in Western economies that has developed over the last few years in conditions of near-zero interest rates. Interrupted the celebration of life that now prevails in the United States, where economic growth has led to almost full employment, as it directly threatens the acceleration of inflation. However, the IMF has retained the forecast aimed to increase U.S. GDP by 2.9 percent by the end of this year. In the second quarter, underlying economic index rose 4.2%, outstripping the average growth of the world economy. The unemployment rate for September updated at least since 1969, and amounted to 3.7%. Next year the fed does predicts decline in unemployment to 3.5%. All this indicates a continued prosperous condition of the American economy that promotes business development. Investors hesitated during the continuation of the tightening cycle in monetary policy: the assessment of the likelihood of a U.S. rate hike at the December meeting decreased from 83% to 76% and a new increase in March next year expect less than 50% of cases. The fed is approaching the neutral level of interest rates of 3% and, unsurprisingly, uncertainty about the future of the regulator is enhanced. For a long time, investors have become accustomed to the predictability of the actions of the Federal reserve, which, after the crisis of 2008, tried to convince the market to maintain low rates for a long time. The situation is changing, which inevitably leads to a reassessment of the positions of investors. However, the fed’s Jerome Powell in no hurry to approve that the policy of the American regulator becomes limiting. Rates rise, but remain below the level at which they inhibit economic growth. On this background of rapidly increasing yields on government bonds, which are readily sold out the last two months. 10-year US Treasury bonds it rose above 3.2%, and for the first time since 2011. Reasons for this can be many. These include inflationary pressures, increased borrowing, selling of us debt by China. One only has to note that the difference between yields on “long” and “short” bonds remains positive. The spread between the “desjatiletki” and “two years old” have widened to 30 basis points. As a rule, before the crisis this difference becomes negative. While this is not observed. The probability of a recession in the next 12 months the indicator from the Federal reserve Bank of new York is estimated at less than 15%. Let’s not forget that Western capital markets are experiencing a large influx of investor funds, and us corporations continue to improve their financial performance. The company profits from the estimated base of the S&P 500 index in the first quarter grew 25% and revenue by 8.6%. In the second quarter, these indices increased by 25.05% and 10% respectively. On Friday, October 12, began another season of corporate reporting. Analysts expect revenue growth of us companies by an average of 19%. Anyway, this is not a reason for sadness: by Russian standards, few can boast such a dynamic business, and the more such “average temperature on hospital”. Autumn is a time of emotion, and often a lot of volatility. By themselves, the concern is not able to reverse the trend, this requires that there is a shortage of money. Life teaches us that Dow theory has not become less relevant over the past 100 years, and continues to encourage investors not to wait for a trend reversal, when we see continued growth. Technically the fall in the 5% is in the range of the corrective movement, and thus a decade of a growing trend. Such a collapse of quotations was observed in the beginning of the year, but it quickly was replaced by growth. In August, the market has already set out to conquer new records on the positive results of the reporting season for the second quarter. The relative strength index is showing signs of oversold the US market after several days is rapidly falling, and rebound should occur because of panic selling going on there. Credit expansion and economic growth in China continues, the price of raw materials and metals near historic highs, and that means money accumulated by investors, and very soon again will rush into the stock market and show vigorous new year rally to the delight of the customers, and Woe to the alarmists, re-build the theory of the inevitable imminent collapse of the market. Regulators have already made a choice at the fork between inflationary and deflationary rebalancing of the economy, and he is in favor of the depreciation of money, not assets. So if something goes wrong, everyone expects that the fed and other Central banks will once again run on the market with pockets full of cheap money, but the regulators themselves it is understood that the heat players also need to be cool and not to bring them courage. In this regard, sharp and maybe even a deep correction is inevitable, but in General they will immediately be redeemed. Stock reliable of money, and, most importantly, they are now much smaller.